Considering I live in Gurgaon, not far from the worst of it in India, this was a book I had been looking forward to since I read the author’s tweets mentioning that he had been working on it. 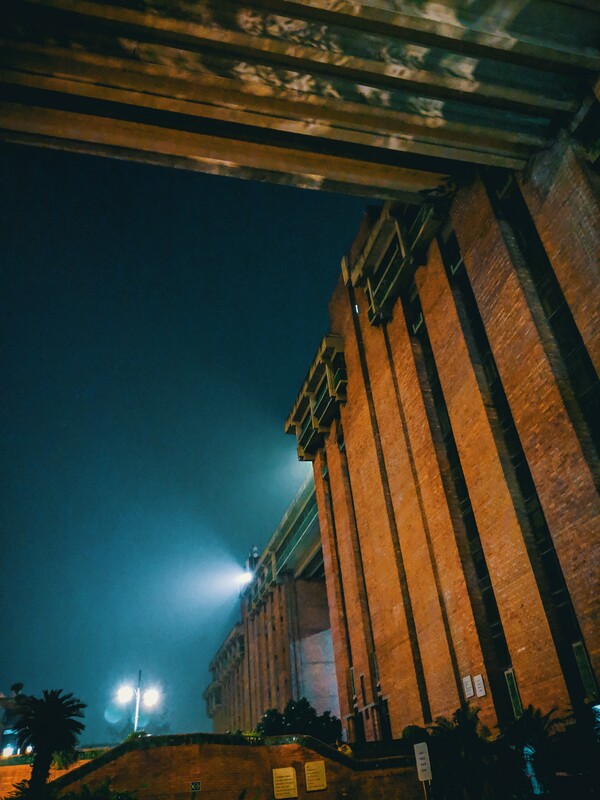 I live and breathe this smog each year. I needed to read this book to know more about my enemy. Well one of them anyway. Siddharth opens the book with a bit of self-aware background. So, there is little one is going to find wrong with this book. The author acknowledges the shortcomings of writing a book on this subject. It is an extremely complicated and layered issue. I’m unsure how effectively this book will convince non-believers. The person standing on a pavement, in the city of Delhi, smoking a cigarette and laughing, pointing a finger at mask-wearing me driving in my car, is unlikely to even hear about this book. Personally, I haven’t seen a single person on the streets of Gurgaon, wearing an anti-pollution face mask this season. As the Delhi government contemplates the ridiculous ban on private vehicles to combat the pollution, the level of awareness amongst citizens seems low. The Supreme Court’s decision to not completely ban Diwali fireworks seems a bit spineless even though implementation of the partial ban itself was difficult as we saw from news reports. Openly flouting rules is somewhat of an Indian specialty, especially in the North. I’ll start with an excerpt from the chapter titled, “Meteorological Misfortune”. 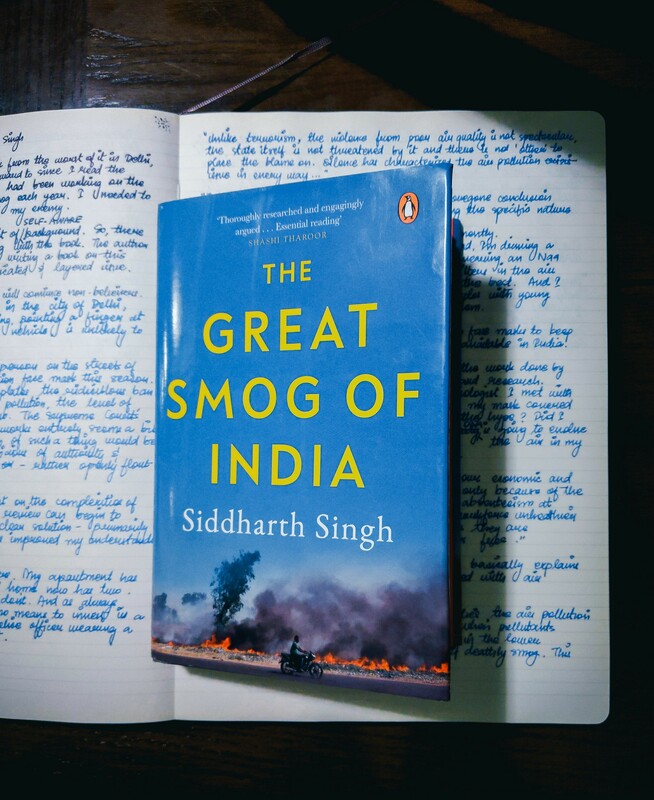 The book sheds light on the complexities of India’s air-pollution better than this review can. I highly recommend you get the book even if you’re remotely interested in this subject. The book might not present a clear solution – primarily because there isn’t one but it has greatly improved my understanding of this issue. Government offices have air purifiers. My apartment has three. My non-believer parents’ home has two this season. But a majority of homes and offices don’t yet. And as always, it is the poor that suffer. With no means to invest even in a face-mask. Even a traffic police officer, in the thick of traffic, wearing a good quality face mask, is a rare sight. Ideally, I’d like to leave North India, permanently. 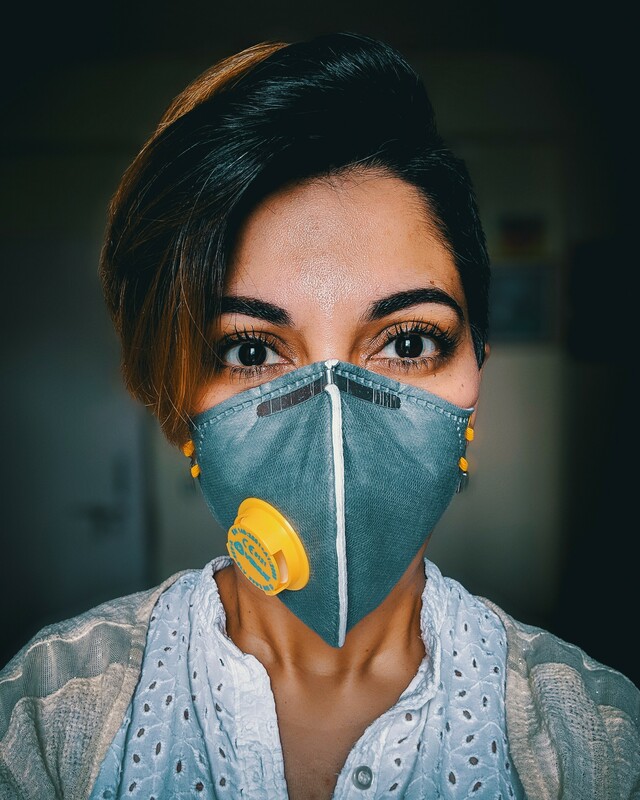 I’m driving a petrol car – regularly checked for pollution, wearing an N99 anti-pollution face mask, replacing HEPA filters in the air purifiers in my apartment and hoping for the best. Even my car has a tiny air-purifier installed in it. And I cannot even begin to imagine how couples with young children are continuing to ignore the air pollution problem. The photograph of a parent with their two children, all three with face-masks, lighting Diwali fireworks, was probably the worst picture I’d seen this year. Currently, I’m freaking out that anti-pollution face masks to keep out PM 0.1 are not available in India. The author has spoken with and delved into the work done by experts in the medical fraternity, policy and research and many other departments. Most of whom agree that the air pollution problem is real and requires a quick solution. My own experience with a senior cardiologist I met recently, was horrifying. He laughed at my mask-covered-face and asked why I’d bought into the hype. Did I not understand evolution? As if my DNA is going to evolve to enjoy all the particulate matter in the air in my lifetime. Or even ten lifetimes. No dearth of dimwits. 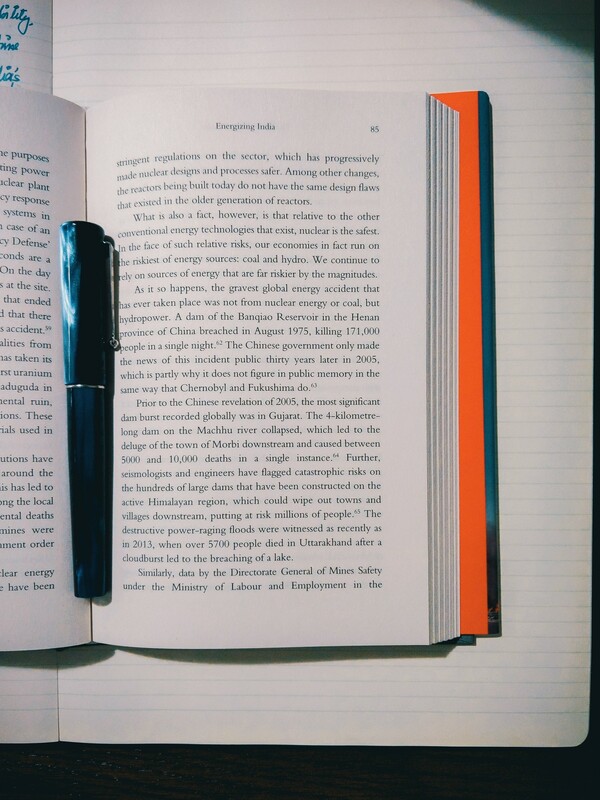 Chapter Four, “Energizing India”, talks about coal, solar and other ways India produces and uses energy. 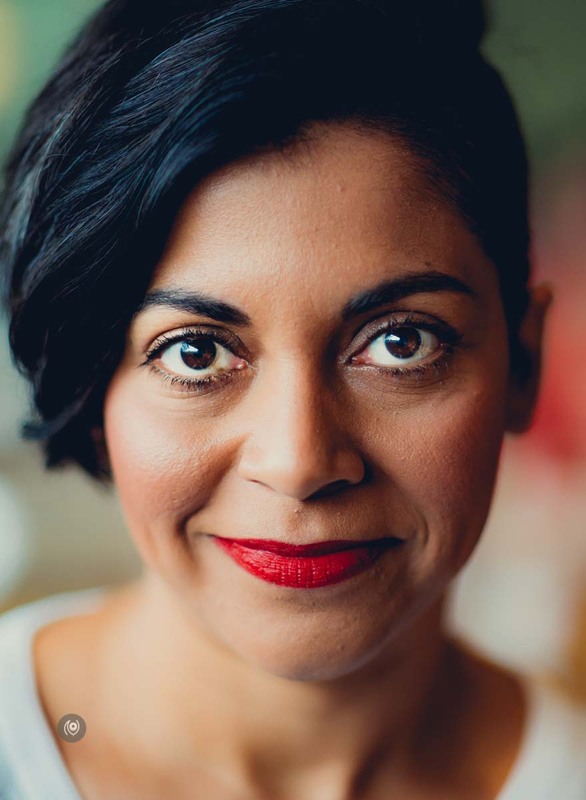 The “Made In India” chapter talks about India’s unique economic and industrial growth and policies that have affected the environment. 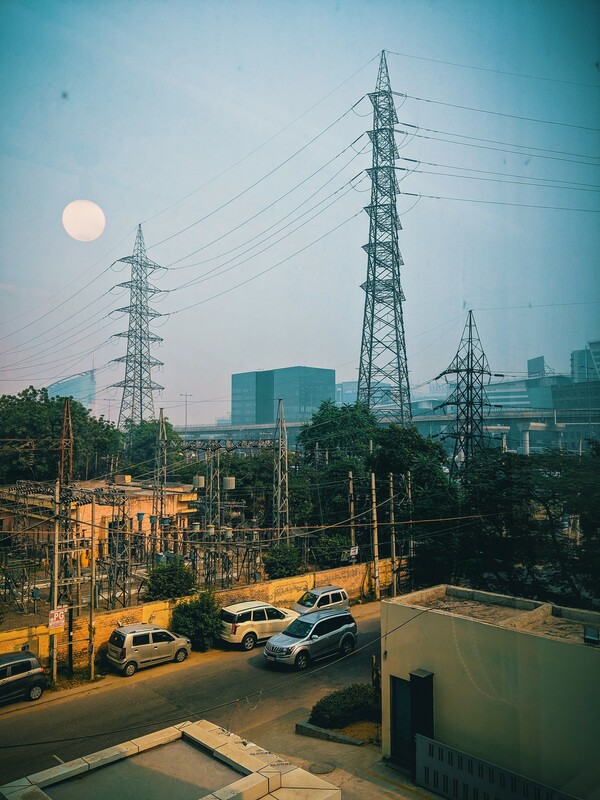 The author takes us from Independence, through our Five Year Plans, to coal and electricity to polluting industries, comparisons with China, brick kilns, the construction sector and even uses Gurgaon as an example. Just a few days ago, a client I was meeting in Gurgaon, exclaimed, upon seeing my face mask, “Oh! You are not from Delhi / Gurgaon are you?” As if only outsiders are weak enough to not be able to tolerate the air pollution. I’ve been seeing Gurgaon grow since the late 90’s. There used to be ant-hills and dust. And directives to my Dad to, “…not stop driving if someone flags your car because they could be dacoits.” The dust is still here. The ants have turned into termite infestations in every possible location. The dacoits and farmers sold their land, became millionaire alcoholics with their children dying in expensive cars wrapped around new Metro dividers and pillars. Gurgaon is a modern Indian city. From certain vantage points, it doesn’t even look like India. Except the haze. The chapter, “How India Moves”, is about transportation in the country and how it has contributed to air pollution over the years. In the early 90’s / late 80’s, my parents, along with me and my sister, moved to Noida. I recall, we were being ferried from the Delhi railway station to a relative’s home near Dhaula Kuan before the Noida accommodation was allocated to my Dad. Probably the first time I was being driven through Dhaula Kuan. Windows of the car rolled down, I was enjoying the big-city air. Also the first time I had an asthma attack. I couldn’t breathe. I was rushed to a doctor who was livid that a chronically asthmatic child was travelling without her inhaler. My parents told him that I did not in fact have asthma but he refused to believe them! Till 1995, when we left for Pune, I, alongwith half my classmates at school, suffered from asthma. On reaching Pune, my breathing troubles magically disappeared. I think of being breathless often when I’m driving through, what is now a labyrinth at Dhaula Kuan. Breathing mask firmly on my face. I’m guilty of polluting too of course. Petrol car. I’ve used the Delhi Metro precisely twice. My apartment has three rented air-conditioners – we try to run them at 25 degrees but during peak summers, that’s entirely ineffective. Sure we haven’t had a TV for over a decade – those TV set emissions saved must count for something. Forget fireworks, I don’t even light candles on Diwali. Driving in NCR is not a pleasant experience and in 10 years of driving my car, it has done about 87,000 kilometers. I don’t drive everyday and have the luxury of working from home. If there was no harassment on the streets and there was last-mile connectivity, I would be driving my car a whole lot less frequently. I’m definitely looking at getting an electric vehicle once those are more affordable. I do, however, feel that as individuals, we must continue to do whatever little we are able to. I NEED my car but I don’t NEED fireworks. I’m on page 138 of the book and I’m thinking that apart from learning about air pollution, I’ve learned a lot about policy making, how government departments work and that I was wrong in believing that India policy makers have done nothing to combat air pollution in the country. The chapter, “The Agricultural Shock”, gives insight into India’s crop-burning problem. The Great Smog of India is relevant for anyone wanting more clarity on the air pollution issue that India currently faces. Not only will you get a good understanding of the reasons why India is suffering, you will also get a glimpse of some possible solutions. The author has managed to gain access to some of the world’s leading minds and their suggestions. The rest of the chapter attempts to explain how government and various institutions function in Delhi. It was hard to read, let alone understand. My head spins wondering what must actually be happening on-ground. And even more so, just what the hell must be happening in the rest of India! A good 33 pages of notes and citations later, I’m feeling a lot more informed about India’s air-pollution crisis. Am I going to engage with pavement-smoker-finger-pointer-laugher? Highly unlikely. But I might engage more with my friends and family. With my air-pollution mask firmly affixed to my face, especially during the current season of The Great Smog of India. I think this book review reads more like a book report. Which probably goes to show how seriously I would like you to take this issue. It IS a matter of life and death. Don’t believe me but do believe the experts. 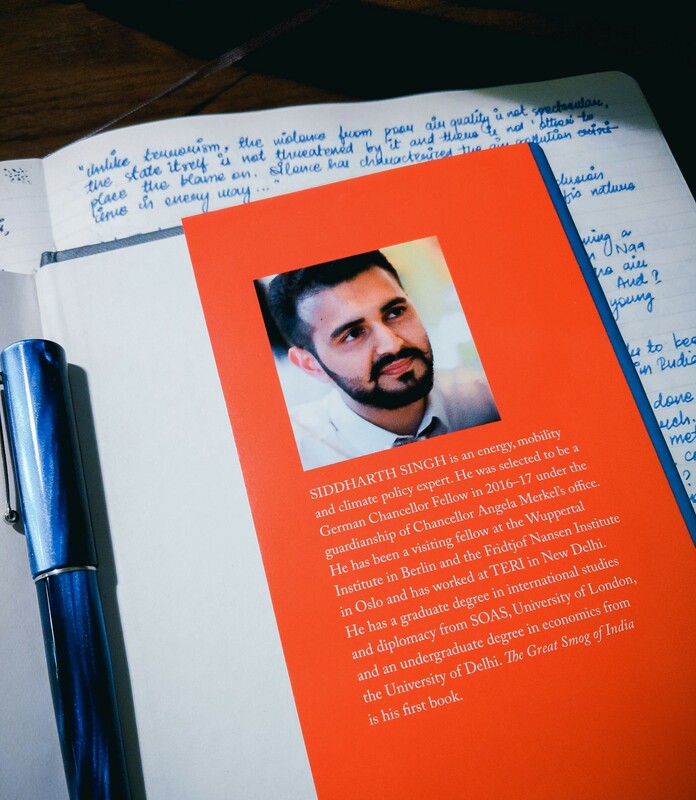 Siddharth Singh is an energy, mobility and climate policy expert. He was selected to be a German Chancellor Fellow in 2016-17 under the guardianship of Chancellor Angela Merkel’s office. He has been a visiting fellow at the Wuppertal Institue in Berlin and the Fridtjof Nansen Institute in Oslo and has worked at TERI in New Delhi. He has a graduate degree in international studies and diplomacy from SOAS, University of London, and an undergraduate degree in economics from the University of Delhi. The Great Smog of India is his first book. Siddharth on Twitter. The Great Smog of India on Amazon. The face mask I’m wearing is Venus N99 from Smart Air. I do not recommend VogMask only because of the 10x pricing and the not very good face-fit.